Mary's godparents like to tap their toes and fingers to a good ol' Big and Rich song while cruising to Wisconsin for a weekend get-a-way. 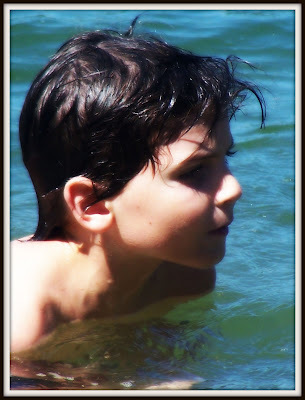 And since this post is dedicated entirely to them, for their thoughtfulness, patience, and generosity, I've picked this rockin' little number in their honor to accompany my photo of Elijah having an amazing time swimming and diving for hours on end in the lake behind their cabin. I could kick myself for wasting my camera's batteries (and leaving without my charger!) on ridiculous car portraits on the drive up and thus not being able to capture for all eternity some really special moments including campfires, a kayak, birthday celebrations and a late evening round of Trivial Pursuit. Believe it or not, some couples might think twice about opening up their cozy home away from home to seven adults and their nine active children but then again, not all couples have hearts as spacious as our dear Greg and Marian, or nerves of steel. I have to be honest, I'm not a good traveler. I hate packing and unpacking and sleepless nights spent adjusting to a new environment, but this trip left me refreshed, renewed, and more in love than ever with my friends and family. Thanks again and again and again for your hospitality! Also, I read your post from last week about clean, wholesome books about and for young girls. Have you and/or Priscilla heard of or read the Betsy-Tacy books by Maud Hart Lovelace? They are, to this day, some of my favorites and I recommend them highly.